First Line: The ring of the hospital pager ripped through the quiet night like a gunshot. Hotshot realtor Darby Farr made a new life for herself in California because she wanted to get away from her controlling aunt and the small island they lived on in Maine. After a phone call from her aunt's assistant, Darby finds herself returning to Hurricane Harbor whether she likes it or not-- she has to fulfill her dead aunt's last wish that she close a deal on a multi-million dollar sale. Darby doesn't plan on being there long. After all, the sale of Fairview is pretty much a done deal... until a local resident digs up an obscure deed restriction and kills it. Speaking of killing, the back-up buyer for the estate is found hacked to death on Fairview's grounds. Confronted with a desperate buyer, a dangerous local, and a storm making its way up the coast, Darby's time to salvage the sale and prevent additional deaths is rapidly running out. Have you ever identified the killer early on because one of the characters was just too good to be true? That's what happened to me while I read A House to Die For. Since that's happened to me more than once, I don't let it put me off reading the book as long as something else within its pages is holding my interest. Indeed there were other things holding my interest: the book's setting on a small island off the coast of Maine and the knowledge of real estate that the author shared. Towards the book's end, I also found myself in a small sinking boat out on the open sea in the middle of a storm. Not only were those particular scenes very exciting, I think I'm still a bit seasick. 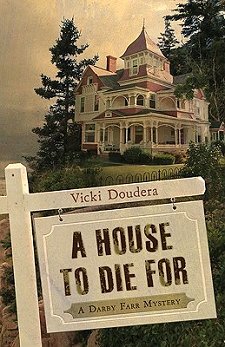 I have to admit that the cover of this book was its major selling point, and although I hoped that the house and its history would figure more prominently in A House to Die For, I was ultimately disappointed. The characters were well-drawn, but for some reason I never really "clicked" with any of them, which means I doubt I'll continue with the series. If you're less of a character-driven reader than I, don't let me put you off. Your mileage is almost certainly going to vary, and there is a lot more to this book than its characters. I think that wonderful house and the setting in Maine would have forced me to pick up this book too. Sorry it disappointed. Such a promising premise! I may pick it up anyway - although your judgement is usually very good for my tastes. What to do, what to do? Barbara-- I'm still trying to figure out why I didn't click with the characters!